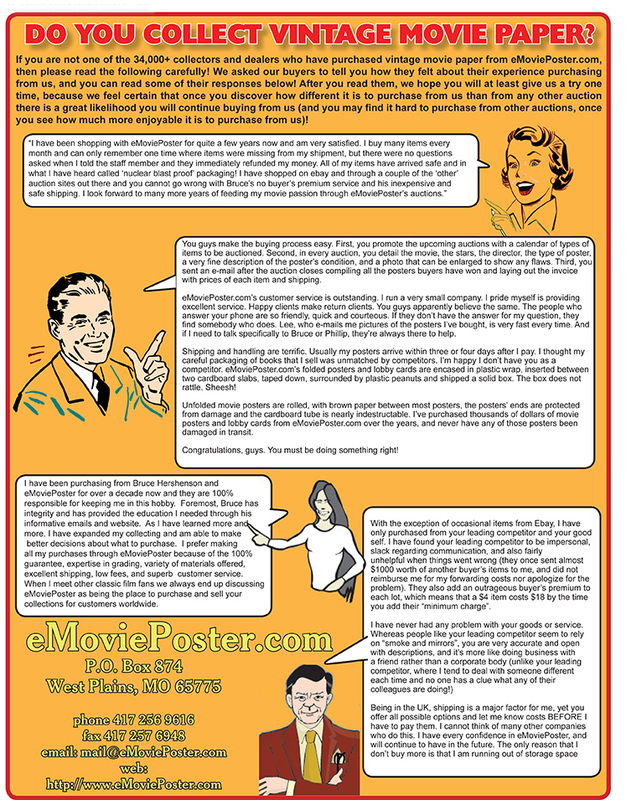 Did you know... that more and more owners of large quantities of movie posters the world over are finding eMoviePoster.com? Many collectors ask us WHERE we get so very many posters from non-U.S. countries that we auction almost every week. After all, there have been very large quantities of U.S. posters available for many decades (most of them originated with the many U.S. poster exchanges that were bought out by very intelligent dealers, who could see what a great investment they were when next-to-no-one else did! ), but until a few years ago, movie posters from other countries were almost always very hard to obtain. Yes, there were a few visionary dealers like Jose Carpio, Albert McFadden and a few others, who decades ago traveled the world over to find non-U.S. posters and then sell them within the U.S., but until the rise of the Internet, it was still very hard to find any substantial number of non-U.S. posters. But once the Internet in general (and eBay in particular) took off in the early 2000s, a much greater number of non-U.S. posters became available to U.S. collectors. But there was a real problem in buying from international sellers, because there could be difficulties in paying due to currency differences, some sellers did not pack well, some items were misdescribed, and there was often no recourse if the deal "went bad". And that is where eMoviePoster.com shines! We accurately describe all the non-U.S. posters we auction, and we, unlike ANY other seller, give a LIFETIME GUARANTEE as to year of release, and whenever we do find we made an honest error, we contact the past buyers and offer them a full refund, including shipping, even if many years have passed. 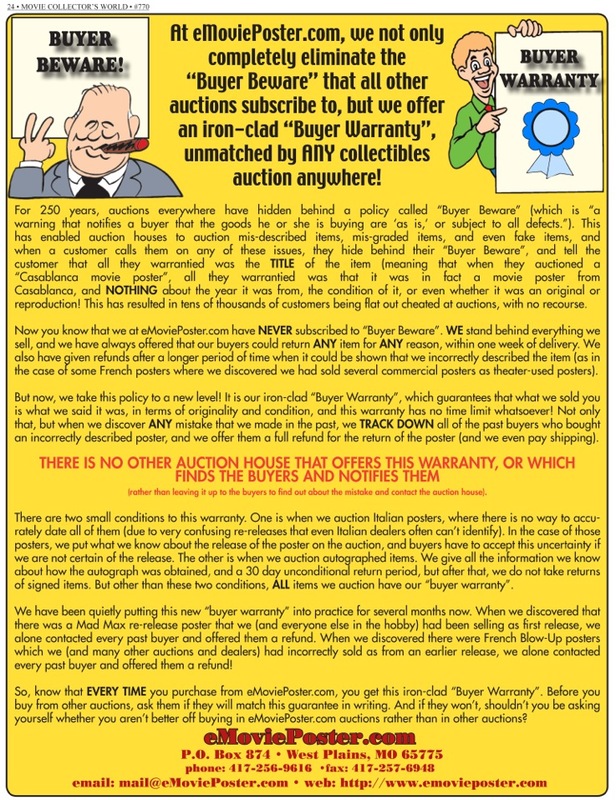 There is NO other major auction anywhere that guarantees ANYTHING they auction (they hide behind a centuries old policy known as "Buyer Beware", which means you are stuck with any misdescribed purchase). 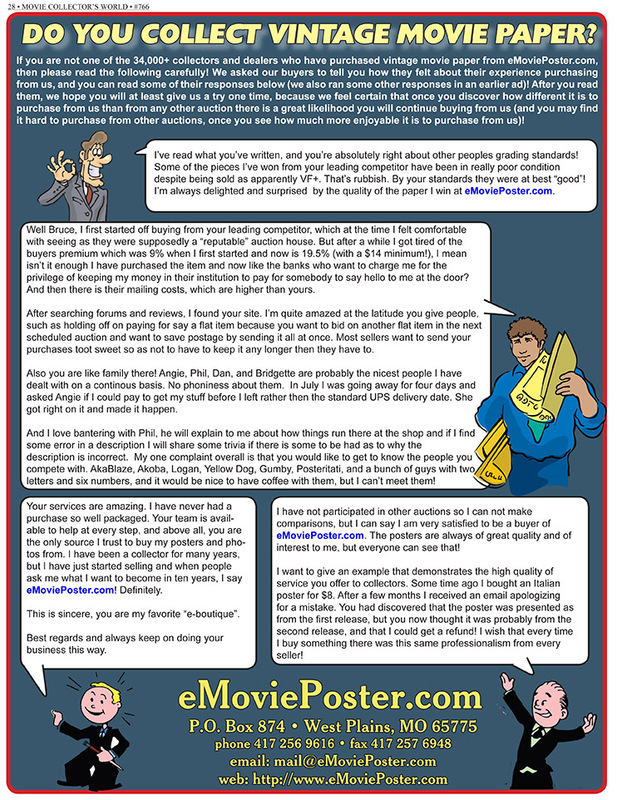 This has resulted in buyers being willing to pay more to eMoviePoster.com for non-U.S. posters than they would to any other online seller, and that has not gone unnoticed by the many people the world over who have large quantities of movie posters from their countries (often because they also bought out poster exchanges in their country). With every passing month, another major dealer from another non-U.S. country gives us a try by consigning a first package of posters, and they are almost always SO happy with their results that they quickly start sending a large package every month or two, which is why we are able to have as many auctions of non-U.S. posters as we do. 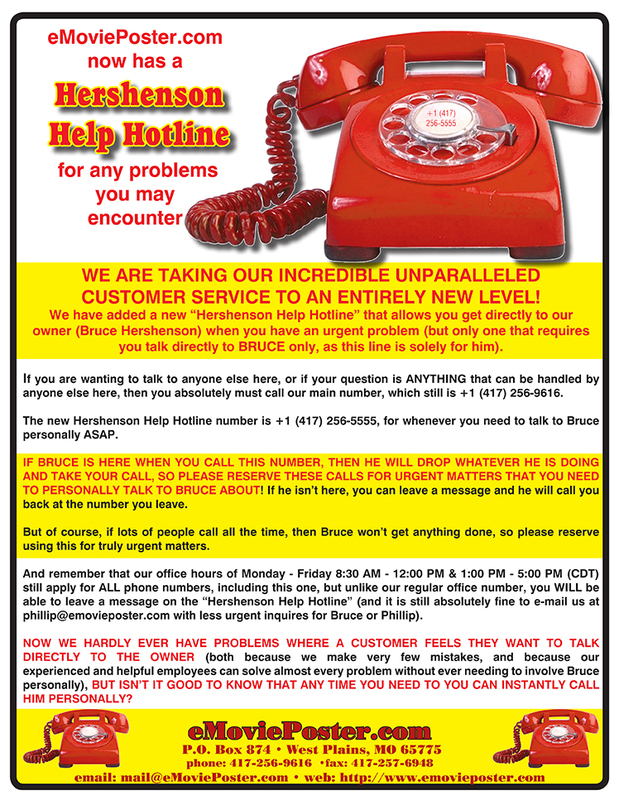 And yet the BUYERS often benefit from this as much as the sellers do! Why? Because if you buy a single poster from a seller in say, Japan, the shipping is likely to be $30 to $40 or more (if they pack it well). 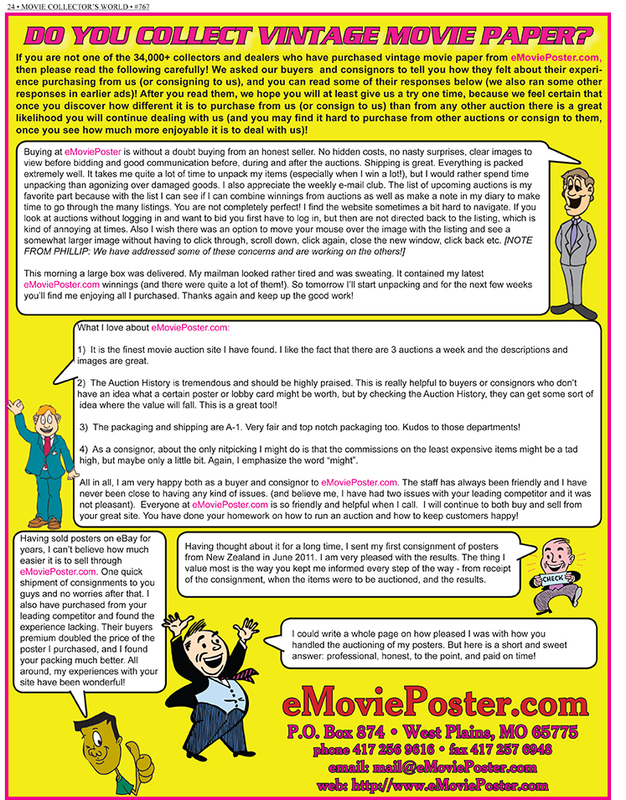 Yet when you buy from eMoviePoster.com, you can buy many posters in a single set of auctions, and you can accumulate wins from many auctions, and have them all sent in a single package whenever possible, which can bring the cost of shipping per poster down to $5 or $10 each, a giant savings over buying them all from different sellers! We hope that 2019 brings us even MORE consignors from countries the world over, because we love to often so many different and varied posters on a weekly basis!